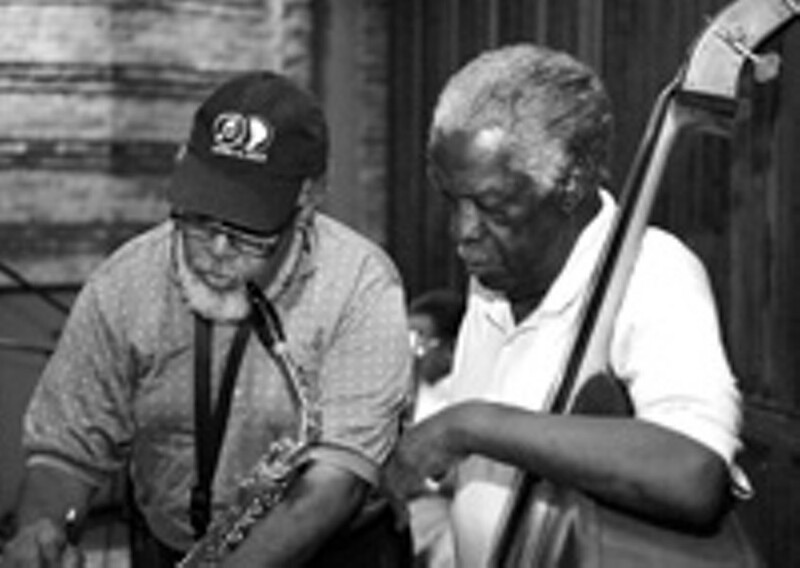 Don VerPloeg/VP Communications Saxophonist Carl Atkins and bassist Keter Betts work on recording "It Don't Mean a Thing..." This year's Swing 'n Jazz Fest is dedicated to Betts, who died last August. What's the best way to warm up for the Rochester International Jazz Festival? Attend the festival that started it all. Swing 'n Jazz IX, Rochester's longest-running jazz festival, sponsored by and benefiting The Commission Project, takes place Friday, June 2, through Sunday, June 4. TCP sends top-notch musicians to schools around the country, exposing students to jazz and classical music. The project also commissions pieces from a variety of composers who work directly with the students. This year's Swing 'n Jazz pays tribute to legendary bassist, and festival veteran, Keter Betts. Betts, who played and recorded with Ella Fitzgerald, Dinah Washington, Stan Getz and Antonio Carlos Jobim during his long career, died last August. There are many different components of Swing 'n Jazz (see schedule highlights below), but the big news this year is the release of a festival CD, It Don't Mean A Thing If It Ain't Got That Swing, by Fred Wesley and the Swing 'n Jazz All-Stars. This is not just a charity album that should be purchased because the money goes to a good cause; this is a great album. It marks a return to jazz roots for Wesley, best known as trombonist-arranger for James Brown and Parliament/Funkadelic in their heydays. It is also the last recording made by Betts. "So much of what I enjoy in life is serendipity," says Ned Corman, founder of TCP. "The record came together that way. We got a wonderful recording with some great original material." Jeff Penney, who runs Sons of Sound, the New York record company that released the album, had discussed the possibility of a CD with Corman for years. The project took off when State Senator Jim Alesi and County Executive Maggie Brooks provided funding support. Corman enlisted Steven M. Gates, a long- time record executive for BMG and other companies, to produce it. Gates was Corman's student at PenfieldHigh School in the 1970s. The album begins with Wesley's "Wicked Walk," a funky strut. His straight-ahead solo reminds us that before his James Brown years, Wesley played in the Count Basie Orchestra. Next comes drummer Akira Tana's gorgeous ballad "Dream Catcher," showcasing the magnificently slinky alto saxophone of Carl Atkins. The album does not let up. Rich Thompson's "Eventually" is a little-big-band tune with a superb trumpet solo by Marvin Stamm and an equally adventurous piano solo by Mike Holober. Bob Sneider's "Par Three" is a playful composition, beautifully arranged with horn lines built off of Sneider's guitar chords. Atkins' "Acirfa," titled in the backwards tradition of Sonny Rollins' "Airegin," is also worthy of the Rollins tradition in terms of its strong melodic lines. Sneider, Stamm, Holobar Atkins and Wesley all turn in strong solos on this track. Perhaps the most unusual cut on the album is a duet between bassists Betts and Jay Leonhart on "Just SqueezeMe." If the idea of two basses seems absurd, you haven't heard what two giants can do. Other cuts include fresh arrangements of the title track and standards "Body and Soul" and "Emily" along with Leonhart's vocal tribute to Ray Brown, "Missin' RB Blues." Finally, there is "Head Start," a Betts romp, with one of the catchiest bass lines to be heard anywhere. Activities at Swing 'n Jazz start early this year with a pre-festival Community Drum Circle at noon Thursday, June 1, weather permitting. You don't have to be a professional drummer to join Kristin Shiner-McGuire (director of percussion studies at NazarethCollege) and more than 100 local percussionists, including Eastman School of Music professor and former RPO timpanist John Beck. Just bring a hand drum to the corner of Main and Gibbs Streets and beat it. Every year a different instrument is featured at the festival's opening event. This year it's Drummers' Night Out, at 7:30 p.m. on Friday, June 2, at the Country Club of Rochester. Beck serves as music director of a program showcasing the talents of percussionists Shiner-McGuire, Bill Freiberg, Bill Cahn, Rich Thompson and Jason Wildman, along with Howard Potter (vibraphone) and Jay Leonhart (bass). Look out for flying drumsticks when the solos start to heat up. The good/bad news is, as of press time the event was sold out. Info for this and other events: http://www.tcp-music.org/snj2006.html. Education is the mission, and Swing 'n Jazz offers a chance to learn from the stars. Free workshops on jazz and improvisation for anyone with or without an instrument will be held 9-11 a.m. on Saturday, June 3, at Eastman School of Music, Nazareth College, Greece's KirkRoadElementary School, Abelard Reynolds School No. 42, and School of the Arts. A new workshop for music teachers takes place at EastmanCommunityMusicSchool. Students who attend workshops receive complimentary tickets to Saturday evening's Gala Jam Session. Info:585-377-1566or http://www.tcp-music.org/snjworkshops.html. Some the wildest events in the history of jazz are no-holds-barred jam sessions involving top-notch players trying to out-do each other with the hottest licks and the most adventurous improvisations. If you think they are a thing of the past, you haven't been to a Swing 'n Jazz Festival Gala Jam Session (8 p.m. Saturday, June 3, at Hochstein Performance Hall, 50 N. Plymouth Avenue). Musicians include Marvin Stamm (music director), Carl Atkins, Phil Flanigan, Mike Holober, Paul Smoker, John Sneider, Jay Leonhart, Bob Sneider, Rich Thompson, Scott Whitfield, and Mark Kellogg. Tickets: $50 VIP; $20 general admission; $10, students. (Tickets available through Ticketmaster: 232-1900 or ticketmaster.com.) The jam session usually features a couple of students from the Saturday morning workshops. A similar spirit can be found at Dine 'n Jam, a music session that occurs at the end of a day of golf. Other highlights include the cooking talents of Russell Ferguson (of Tastings) and Jeff Traphagen. The Swing 'n Jazz Golf Tournament takes place 11 a.m. Sunday, June 4, at Greystone Golf Club, 1400 Atlantic Avenue, Walworth. Dine 'n Jam at 5 p.m. will feature many of the musicians mentioned above. Info: 377-1566.